One of my best friends just moved to Minnesota. It's pretty heart breaking (especially since she went from Arizona summer to cold already!) Naomi is my go to friend for good recipes and exciting things to feed my family. She's the one I call when I see a great deal on some fancy cheese to see if she needs some just in case. When I was picking up a case of Utah peaches last week it made me think of her, so I called to say hi. She said there weren't any peaches to be found in her frigid new home (haha, comparatively at least) but there were apples coming out her ears! When I baked up this quick, easy bread/cake from this week's Tuesdays with Dorie treat, I couldn't help but think of her. I used homemade apple sauce instead of the apple butter, reduced the sugar by about 1/4 cup, and added some extra grated apple. This bread is extra appley (and I'd totally send some Naomi's way if I could!) Thank goodness apples can be found everywhere, from hot Arizona to far away Minnesota, because everyone should make this yummy cake! Grab the real recipe from Lynne. I'll be back later with a printable version of my highly adapted recipe. I'm so sorry that your friend moved. Having been the moving friend, it is difficult. 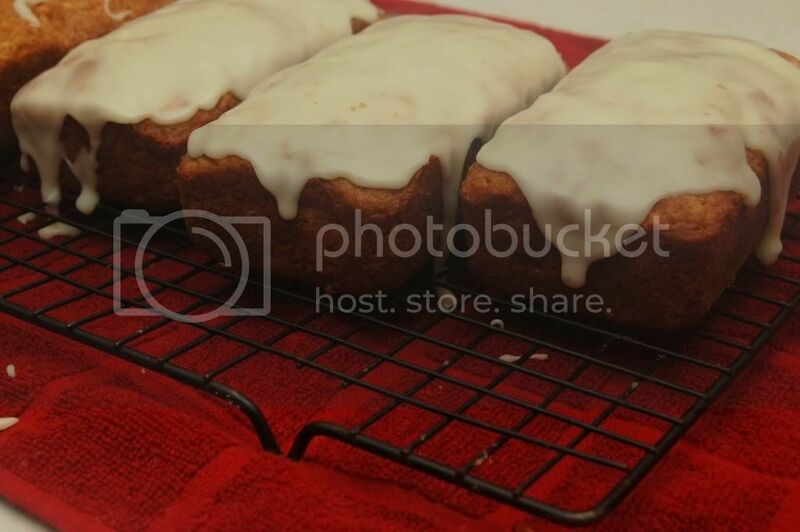 Love your loaves with all that icing! Yummy. Sorry to hear about your friend moving, I know there is always the telephone/e-mail, but it isn't really the same, I know! Looks fab! I feel for your friend- I would die that far north from the cold! Your loaf cakes look fantastic! I wish I could get a perfect icing like that! Mine is always, too thin, too thick, too gloppy ... never just right! It's so hard to say goodbye to friends and moving is the pits..been there done that! Your cake looks so incredible, I love it! You will think of ways to keep you friendships alive over the miles..I do so with 4 BFF of mine! Your loaves look delish. I bet the glaze thru them over the top. We loved this recipe. Love your adaptations...looks scrumptious! Thanks for baking along! Love your loaves! Sorry about your friend. That is always hard. Oh, so sad that your friend moved. But maybe long-distance apple cake baking sessions will help you feel closer. Your loaves look great! We loved this one too. Bring on apple season! Your cake looks wonderful. I can't wait to try it. So sorry about your friend moving. Wow...those loaves look so good with all of that glaze on there!! Sweet post, too. you could totally send her a couple of loaves. well wrapped priority. Love that you made loaves. Double delish! Your blog is amazing and what cute kiddies. Happy Tuesday!